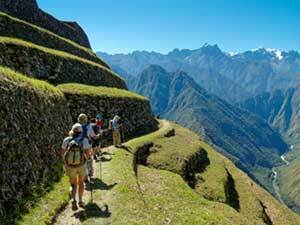 "We are 100% Local Tour Operator"
The Short Inca Trail trek is often known as "the two day Inca Trail to Machu Picchu". Tours Cusco and Machu Picchu "Classic"
Tour Peru and Machu Picchu "Classic"
Tour Cusco and Machu Picchu "Trekkers"
Tours in Peru and Machu Picchu "Trekkers"
The Salkantay Trek is a famous trekking in Cusco and is a great alternative to the Inca Trail to Machu Picchu. Going this hike, you’ll be able to see some of the most beautiful places in Cusco - Peru and see the snow covered Mountain, and also pass through Salkantay Pass, Salkantay altitude is 20,574 ft (6,271 m). You will have the opportunity to see beautiful landscapes with a variety of endemic flora and fauna, and camping at night in the middle of the sacred mountain. The Salkantay Trek is a hiking in south America and an alternative to the traditional Inca Trail for reaching Machu Picchu. It presents a unique combination of culture and mistic, with preserved proudly by the Peruvian people, and is an amazing adventure and extraordinary natural beauty. Salkantay trekking is set at the highest peaks of Humantay Mountain, where the cold ice of the mountains meets the steamy heat of the Andes. The hike is surrounded by the historic Machu Picchu (National Park and is considered one of the 25 best hikes in the world). Salkantay trek is very diverse and rich geography hike, Andean culture and history. The Vilcanota Mountain range contains two twenty highest mountains in the Americas. The hike along this route offers an amazing diversity of attractions and adventure opportunities found nowhere else on earth. Imagine a walk with a breathtaking view of the most beautiful mountains in the world or a dip in the hot springs of Cocalmayo in the forest, all within a distance of only 50 kilometers. Ready to go? ITEP Eco Travel will make it easy to get started! 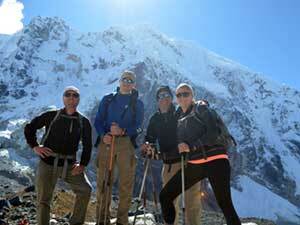 Book now or Contact us to our famous treks in Peru. 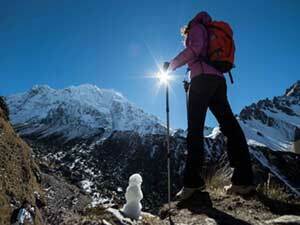 Top 10 Tips to Remember While Trekking in Salkantay! Salkantay Trek to Machu Picchu, this alternative Inca trail was recently named among the 25 best Treks in the World, by National Geographic Adventure Travel Magazine. The best time to travel is March through October. Sure, it's the busy season (especially June to August), but it's also the dry season. And for Sure, you not going to want to visit this site during rainy season! A day of this hike will be more hard and a night will be more cold. Make your reservations for this tour and Huayna Picchu Mountain hike, several months in advance 2, 3 to up to a year, if you're going during peak season. You Must take your passport and a photocopy of it, but it is not sufficient, you have to keep it in a plastic bag in case of rain. If you are student is valid only the ISIC – International Student Identity Card (the green card). There are some biting mosquitos at Machu Picchu, Santa Teresa and Aguas Calientes, wear long light clothing and use plenty of strong insect repellent. Avoid open toed shoes! Be prepared with sun protection, including a hat, sunglasses and sun block. Some people even take in small umbrellas, a. Feel free to look like a little daft, but don’t get burnt! Time is a little funny here in Cusco, one day can be hot and not another day. Take some Peruvian currency for buying bottled water and snacks along the way, as well as for tipping the guide, cook and porters. Waterproof, well worn-in walking boots - Good quality, comfortable footwear is essential, and a sleeping bag is neccesary too. There is only 1 snack bar at Machu Picchu, be prepared with snacks and drinks to see you through the day and night. Going Machu Picchu - Huayna Picchu and do not want to have altitude sickness in day 1, day 2 or day 3, you should walk before travel long distances, this will help your body is prepared when it lacks oxygen, and so can know how you feel when you are in Cusco. This is our way of life and we love what we do! ITEP Eco Travel was founded on an undisputed passion for discovery and adventure and the desire to share our knowledge and experiences with You.